IN an afternoon of high drama at Downpatrick on Sunday, the stewards were kept more than busy on a great afternoon’s racing. The stewards first engagement came after the Molson Coors Handicap Hurdle.In this race Folly Dat set out to make the running under Andrew Ring who just recently rode his 65th winner, losing his right to claim a 3lb allowance. The partnership was still in the lead as the race came to a conclusion, but the leader then drifted into the running rail as Danny Mullins put in a challenge on Shine in Dubai. However, the leader remained in front to the judge, winning by one and three-quarters with Smiling Jessica back in third. There was no change to the judge’s placings as the rider of the second didn’t have to stop riding. The winner is owned and was bred at Dromore by solicitor John Taylor and is trained in Armagh by Keith Watson. SP 10/1, 3/1 joint fav, 3/1 joint fav. There was also a controversial end to the AJC Group Newcastle Handicap Hurdle. Racing up the hill to the judge, Blue Skimmer, ridden by Liam McKenna for Armagh owner Richard Behan had the advantage, but was lent on by Lleyton, ridden by Barry Geraghty. As these two battled it out, Conor Maxwell came with a good run on Muroor, trained by Tom McCourt to win by a length over Lleyton with Blue Skimmer third. As expected, a steward’s inquiry was called, but concluded that it did not involve the winner. Then came the announcement that a further inquiry was to take place, into the weighing-in of the winner. The result of this inquiry was that Muroor was disqualified as the rider had weighed in 1lb light, with the original second Lleyton, trained by Jimmy Finn in Tipperary, promoted to first, Blue Skimmer second and Lusis Naturea, ridden by Karin Ferris third. SP 9/2, 0/30, 12/1. Ruby Walsh travelled up for just one ride at the meeting on Eclat Des Mottes. The 4/7 favourite in the Jim Devine Concert Maiden Hurdle saw six go to post and the Willie Mullins-trained runner won in smooth style from Present in Court, which was bred by Graham Morrow with Sonowyouno, ridden by Barry Geraghty in the colours of J P McManus third. Co Carlow-based Mullins then went on to saddle the easiest winner of the day when the newcomer Rebel Og, owned by the large Lions Mouth Racing Club, ridden by his record-breaking amateur rider, saw 28-year-old Patrick come home 17 lengths clear of Neptune with Geordiebest third ahead of Decor Irlandsais. The jockey said post race that his mount had ran a bit green, but once in the lead shot clear, a horse to look out for by the look of things. SP 10/3, 6/5 fav, 16/1. It was a good day for the Mullins family as Willie’s sister-in-law Mags saddled the 5/6 favourite Agusta Gold, ridden by her son Danny to win the opening Keeping It Country Maiden Hurdle. Running a fine race to finish second was Derecho Storm, ridden by Karin Ferris in the colours of her father Brian of Dundrod. This one being bred by her mother, a 50/1 shot. This second-placed finisher was chased home by Milomynit. Perfect in Pink, ridden by Grand National winning jockey Derek Fox that had set out to make all, came to grief at the final flight, but looked held at the time. Mags and Danny have a good record at this track in recent years. Most valuable race of the day was the Major William Brownlow Memorial Rated Hurdle and victory went to another trainer who does well at the venue, Waterford-based Henry de Bromhead with Babbling Stream at 8/1 winning in good style over long time leader Go Another One with Eight Till Late third. For successful jockey Hugh Morgan it was his second success in his short career. The Birthday Greetings Mares Handicap Hurdle saw Gordon Elliott and Davy Russell keep up their good strike rate at the track when Mill Quest ran out the smooth winner from 33/1 shot Sinndar Sandy and Filly Mullins that had looked good for second place, but lost out in the latter stages. This brings Gordon’s total for the year at the course to eleven while Davy has six. At Sligo on Wednesday, Glenbank King in the colours of Portadown’s Victor Robinson was a 25/1 winner, this horse trained by Lee Smyth at Moira. The following day Bangor trainer Clare Gannon kept up her good run when she saddled her father’s Innamorare to win at Leopardstown, ridden, like Glenbank King, by Chris Hayes following a quiet couple of weeks in the saddle. 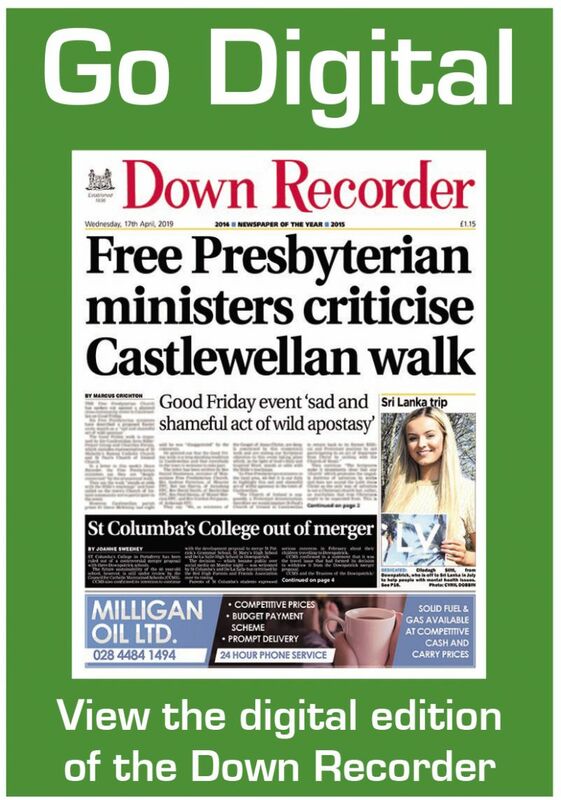 Acting stewards at Downpatrick were Mrs Alison Millar, Hugh Ferguson, Peter Stewart and Tom Breen. Belfast jockey Jordan Canavan is out of action following his recent fall at Sligo, he broke his right wrist, damaged an AC joint and dislocated his shoulder. Next Downpatrick meeting, Ladies’ Day, August 27. Congratulations to Steven Magee, the Strangford trainer and former good amateur jockey on his recent marriage to Emma Ridgeway, Steven is also a director at the course and an owner. Congratulations also to Leo Mooney, the course farrier, and his wife on the recent birth of a son Jacob Isaac.